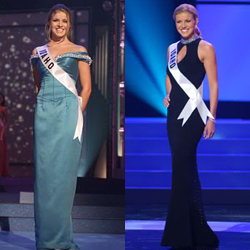 This page details the Miss Idaho Teen USA titleholders who have competed at Miss USA or competed in Miss USA state pageants. Click here for a full listing of Miss ID USA & Teen USA titleholders. Seven former Miss Idaho Teen USA titleholders have competed at Miss USA, including Idaho's only Miss Teen USA titleholder Brandi Sherwood (89). Brandi was Idaho's first contestant to make the cut at Miss USA in over thirty years and their only top five placement. When Brook Lee won Miss Universe, Brandi became the first contestant to hold both the Miss Teen USA and Miss USA titles. Kimberly Weible (98) later became Idaho's third Miss USA semi-finalist. Miss ID Teen USA 1998 is a "Triple Crown" titleholder, holding both the Miss ID USA and Miss Idaho titles.